On the beach. Penthouse views. Beautiful furnishings and a complete gourmet kitchen. Your luxurious, two bedroom, two bath, Penthouse condo at 'Island Royale' in Gulf Shores faces the beautiful Gulf of Mexico and commands a view from more than 150 feet over America's most stunning beach. 2 Bedrooms, master bed with King, 2nd Bedroom with Queen, plus pull-out sofa. Luxury awaits at every turn: a full-size, fully-equipped kitchen designed to prepare everything from a microwave snack to a gourmet dinner for six, dining room, living room, three Televisions with full cable access, VCR, Stereo, Full-size washer and dryer, as well as a HUGE balcony suitable for entertaining or just soaking up the view. If that's not enough, there's an indoor/outdoor heated pool, a steam room, a sauna, an exercise room, and of course, your own private beach at Gulf Shores. It's a vacation you will want to repeat over and over. Be sure to click on our own web page (at bottom) to see availability calendar. We live in Wheaton, Illinois (a western suburb of Chicago) and run a small advertising agency. Our Gulf Shores condo is a respite for us and we occupy it two months a year, ourselves. We are the only managers of our rentals, so there is no "agency" to go through; you talk directly with us. We love the huge balcony directly on the beach. Although not included in the official square footage of our condo, it is big enough to be another room and we spend much of our time on it. Our condo, unlike almost all others, is carpeted. this means it is MUCH quieter than other units, no to mention cozier and more comfortable. Our kitchen is equipped for a real cook with all the implements you could ask for. Our linens and towels are high quality and hand-picked by us, so they are much more luxurious than "agency-supplied" cheap stuff. Step off the elevator and you're on the beach! 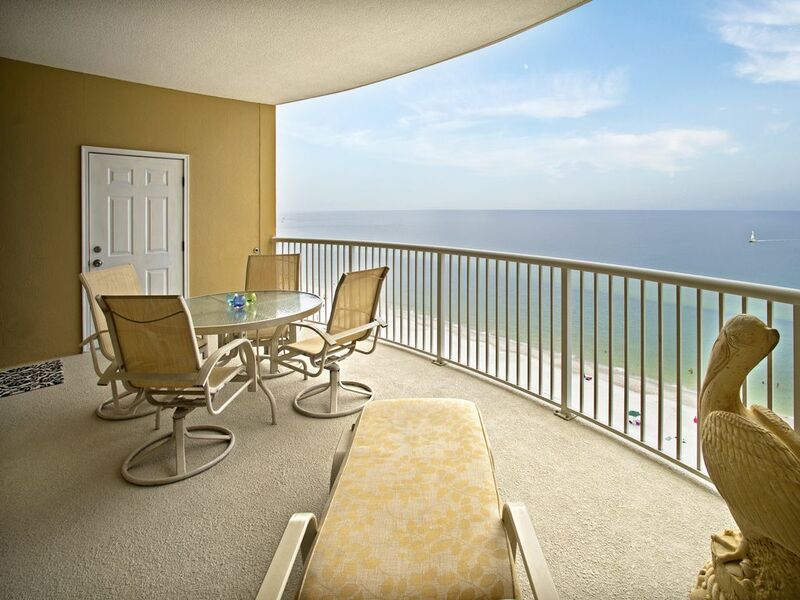 Balcony overlooks miles of Gulf Shores Beach right below you. Free local and long distance. Owner's own linens. 400 thread count or more. In unit. Stackable front loader. New "glass top" electric stove. Fully equipped kitchen for the gourmet cook. Everything you'll need is here. Dining room table for four; counter seating for three more. Huge balcony with table, chairs for 4 and an upholstered chaise. Fro rent across the street. Indoor and outdoor hot tubs on site. This our eighth stay in this condo. Having said that, it indicates how much we enjoy this comfortable condo and the community of Gulf Shores. When you enter the condo you can't help but be struck by the gorgeous view of the ocean and the bright, airy feel. On the large, private, south facing balcony both sunrises and sunsets can be enjoyed. We have stayed in many condos over the years and have found this condo to have the best equipped kitchen of any of them. The condo building itself is very well maintained and we have never experienced any problems with the elevators. Tom, the owner, is very accommodating. We only hope that we have many more years to enjoy this condo. The caption is explanatory and as a former renter of this property...our experience was very disappointing. We will choose a best on the beach property in orange beach, next year. This area has been a family vacation spot for over 13 years and have chosen 4 different condos. Unfortunately, 13 must have been an unlucky choice. I am very sorry the expectations of this couple were not met. As our overall rating indicates, something else must have been wrong. Our condo is always clean and well-maintained. I am sorry about this couple’s experience, however. We love visiting Gulf Shores and Island Royale. The condo is on the 14th floor with a great beach view from the balcony. Quick trip down and we're on the beach! The condo is beautiful, very clean, comfortable beds and well stocked with all the conveniences. Great location with many restaurants close by and just a few minutes from the Pier and the State Park. Thanks Ellen and Tom! Location on beach is nice and it's convenient and in walking distance to many places in town. The unit itself is outdated and run down. It's infested with roaches and the carpet and furniture badly stained. The fixtures in bathrooms are old and tp holders fall off...shower curtain liners are moldy. The complex needs updating to pool which is small. Elevator breaks down a lot. I am so sorry your stay was not up to expectations. The furniture and carpeting were professionally cleaned before the summer season (the carpet is new last year). The roaches were a building-wide event this summer and have been eradicated now. I was blowed away. The pics don’t do this condo justice. The condo and building had EVERYTHING you could want or need. The beds where Crazy comfortable. We even looked to see what the master mattress make and model was and bought the same one when we got home. The owners where amazing to work with. The buildings water was cut off, for sand flush, but we didn’t know what was going on. They where Johnny on the spot to figure out what was going on, and it was back on in 30 mins. If it is avalible BOOK IT! You can stop looking best place and price was super reasonable! Parking spot was also amazing! Only thing I’d be sure to bring your own beach towels. Can’t say enough nice things about this condo. We will only stay here from now on! A short walk to the heart of Gulf Shores. Groceries across the street. We only rent full weeks from Saturday to Saturday. No exceptions.